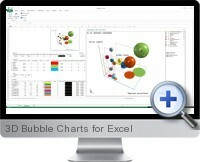 Excel 3D Bubble Charts (5dchart) is a multidimensional data visualization add-in for Excel 2010 or later to create professional bubble charts with up to 5 dimensions of underlying data. The 3 dimensions of X, Y and Z axes are supplemented by bubble size and color to allow five dimensions to be viewed within a single chart. Flexibility and customization options allow to enhance visualizations with styles and projection trends. Simple and fast visualization of complex multidimensional data. Modify individual bubble and axes styles for customization and report branding. Apply bubble projection analysis with predicted trend lines. 3D bubble charts can be applied to a wide range of disciplines including portfolio analysis, scientific results and strategic planning. Simple to use and fast chart rendering directing within Excel. High resolution chart image export for reporting and external applications.